The Tri-logo version is one of the scarcest carded pieces in the entire vintage line. Comments: People dig the vintage Jawa figure. They always have, they always will. When Kenner added the insanely cool material cloak, young collectors had the added incentive to create their own army, their own Jawa Force if you will. Oddly enough, with all the figure?s popularity, which made it one of the very few to make it onto every card back, it is the little vinyl cape most of us threw out when we were young that makes it such a well-known collectible even outside of the Star Wars collecting community. Major Variations: Though all vintage figures have minor variations, the Jawa figure has some of the most interesting and sought after variations in the entire line. The authentic carded vinyl version of the figure was shipped with a vinyl cape not unlike the other removable capes found on the Star Wars 12 back figures. 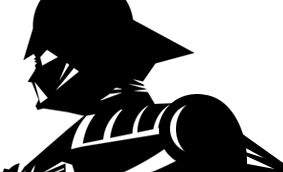 This version is often reproduced, and makes finding a genuine version near impossible for the untrained eye. The vinyl on an authentic cape is a near perfect match to the figure itself, though many fakes that are the right color do exist. Many fakes use slightly retooled Ben (Obi-Wan) Kenobi capes, but these are usually easier to spot. These can often be mistaken for the Australian Toltoys vinyl cape Jawa mentioned below. The authentic carded vinyl cape Jawa sits in a blister unique to this variation with a flat clear piece of plastic behind the figure. An authentic blister is flat along the front and sits very close to the figure itself. There are examples of fake blisters mimicking this one, but for the most part, fakes tend to have the wrong blister all together. The Kenner vinyl caped version shipped only on early Star Wars 12 backs and though rumored to have been shipped on Meccano square cards in France, none have ever been documented and it is popular opinion that it never actually shipped on that card. 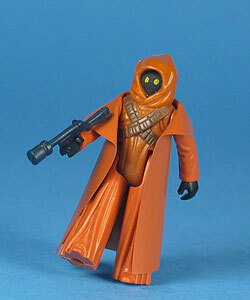 The Jawa?s vinyl cape was quickly replaced by a material cloak and with it, the blister. Early versions of the Star Wars 12 back material cloaked Jawa figures were packaged with the same blister as artoo-Detoo (R2-D2) before switching over to a unique blister that slanted out forward on the top half. The Toltoys vinyl cape Jawa not only sports a cape in the same color tone as the Ben (Obi-Wan) Kenobi, it shipped on The Empire Strikes Back cards with the material cloak style blister. Though little is actually known about this variation?s origin, there are a few loose examples and even one carded specimen documented.